The "Avengers" entry earned $250 million — beating "Star Wars: The Force Awakens." NEW YORK — A whole lot of superheroes added up to a whole lot of ticket sales. 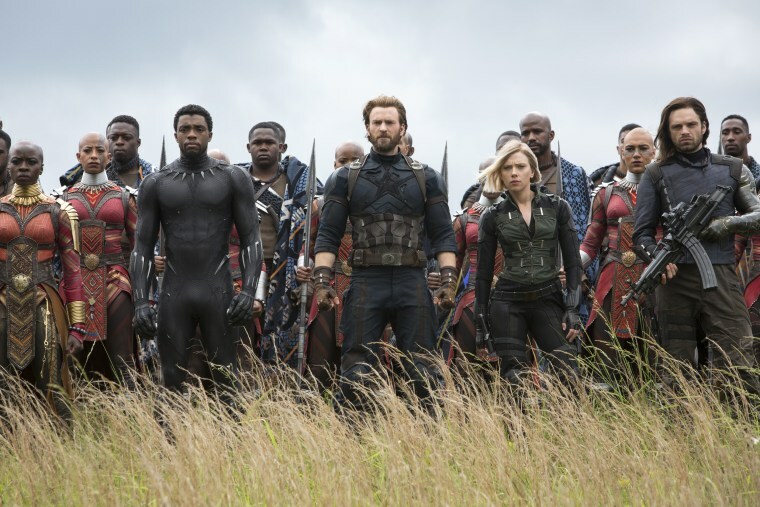 The superhero smorgasbord "Avengers: Infinity Wars" opened with predictable shock and awe, earning $250 million at the box office over the weekend and passing "Star Wars: The Force Awakens" for the biggest opening weekend of all time. "Infinity War," which brings together two dozen superheroes in the 10-year culmination of Marvel Studio's "cinematic universe," also set a global opening record with $630 million worldwide, even though it has yet to open in China, the world's second-largest movie market. It opens there May 11. According to Walt Disney Co.'s estimates Sunday, "Infinity War" overwhelmed the previous global best ("The Fate of the Furious," with $541.9 million) but narrowly topped "The Force Awakens" in North America. The "Star Wars" reboot opened with $248 million in 2015, which would translate to about $260 million accounting for inflation. Both intergalactic behemoths belong to Disney, which now owns nine of the top 10 opening weekends ever — six of them Marvel releases. That includes "Black Panther," which has grossed $1.3 billion since opening in February and still managed to rank fifth at this weekend's box office, thanks party to Marvel fans self-programming a double feature. The track record for Marvel, along with the hyper, extravagant effort put into the long-planned "Infinity War," made the record-setting weekend something of a fait accompli. After 10 years, 18 previous films and $15 billion in box office, the weekend was an assured and long-awaited coronation for Kevin Feige's Marvel, the most dominant force in a Hollywood with precious few sure things. By any measure, the 2-hour, 40 minute-long "Infinity War" is one of the largest films ever assembled. With a production budget reportedly almost $300 million, Joe and Anthony Russo's film brings together the stars of Marvel's superhero stable, including Robert Downey Jr.'s Iron Man, Chris Hemsworth's Thor, Chadwick Boseman's Black Panther, Chris Evans' Captain America, Mark Ruffalo's Hulk and many more. It was shot over 18 months back to back with a sequel that is due out next summer. Marvel spent years laying the groundwork for the big showdown, teasing its villain (Josh Brolin's Thanos) since 2014. The result earned positive reviews (84 percent fresh on Rotten Tomatoes) and an A CinemaScore from audiences. All but one of Marvel's 19 cinematic universe releases have scored A on CinemaScore. "Infinity War" was also the first film shot entirely with IMAX cameras. (Christopher Nolan's "Dunkirk" was mostly shot on IMAX.) IMAX screenings accounted for a record $41 million of the weekend's global ticket sales. Greg Foster, head of entertainment for IMAX Corp., said the success of Marvel stands apart from Hollywood's other mega franchises. "This isn't something that their parents saw. This isn't an old franchise that their parents saw when they were 20," Foster said. "This is theirs. The Marvel universe is the group of characters that this generation owns." Paul Dergarabedian, senior media analyst for comScore, credited Marvel with the potent lead-up to "Infinity Wars" with "Spider-Man: Homecoming," "Guardians of the Galaxy Vol. 2," "Thor: Ragnarok" and "Black Panther" — all successful and well-reviewed entries. "This brought the world together this weekend," Dergarabedian said. "That's what these movies do: They remind us why we love going to the movie theater. A movie like this shows the singular and unique experience of going into a movie theater."